Best Blondie Recipe to make the gooiest and chewiest blondies. Easy to make in one bowl, these blondies are rich, indulgent and flavorful. Brownie recipes are very popular on this blog, and while I have some amazing ones like these: Oreo Cheesecake Brownies, Chocolate Mousse Brownies and Coffee Walnut Brownies, it was time for me to add an equally fantastic Blondie recipe. Best Blondie recipe does not disappoint! If you are looking for the perfect blondie bars, that are thick and chewy, tender and rich, look no further, this recipe delivers it all, plus more. These blondies are incredibly easy to make in one bowl with just a few ingredients, that you probably have on hand. The secret to the amazing texture is skipping the baking soda and baking powder and adding an extra egg yolk. The blondies end up having the silkiest and luxurious center, that it tastes as half baked. If you love cookie dough and brownies, you will go nuts for these blondies. They are rich and chewy, with a beautiful brown sugar flavor. Made with easy to find ingredients and minimum prep work. Made in one bowl only! Easy to transport if you have to take them to a party. Ready in less than an hour from start to finish. 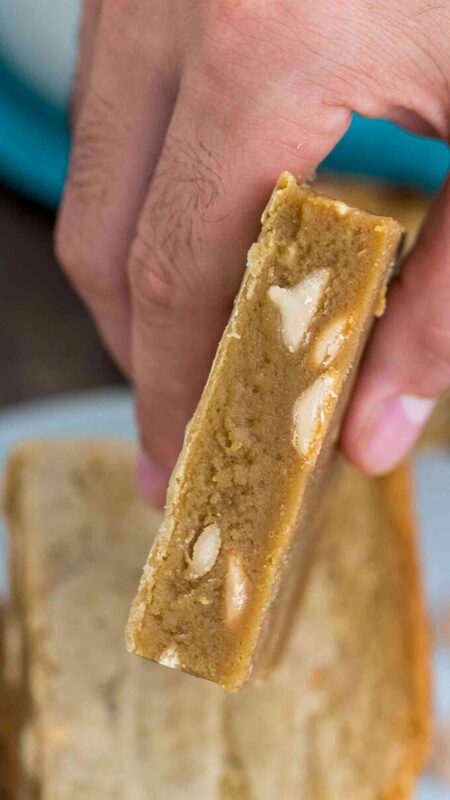 A blondie is basically a blonde brownie, think about it as a sweet dessert that is rich, chewy, gooey, just like a brownie, minus the chocolate. What are blondies made from? Blondies are made from flour, brown sugar, butter, eggs, baking powder, and vanilla extract. 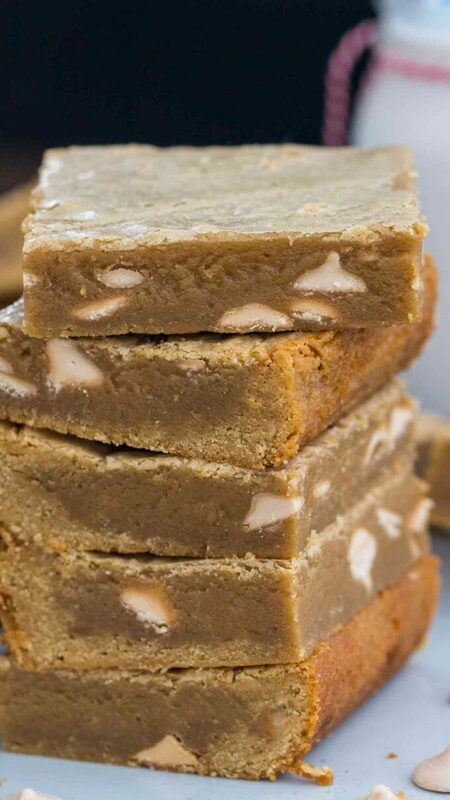 Blondies usually contain some type of chocolate chips and if desired chopped nuts can be added as well. The main difference is in the ingredients. Blondies rely on the brown sugar and butter for their rich and chewy texture. Classic blondies also have butterscotch chips or flavoring. Brownies, on the other hand, are full of cocoa powder, which blondies have none. They are very chocolaty and the texture resembles more a rich cake. Do not over-mix the ingredients, whisk just until combined, and the batter is smooth and shiny. Make sure you don’t over-bake the blondies, they will become less fudgy if you do, but still delicious. Before slicing the blondies, make sure they are fully cooled. Clean the knife after each cut. How long do you bake Blondies for? The baking time is key when it comes to blondies, you don’t want to over bake them, as you need that chewy, dough-like center. Blondies are usually baked between 25-30 minutes at 350 degrees F.
Chocolate Chip Blondies: add one cup of chocolate chips to the batter. White Chocolate Chip Blondies: add one cup of white chocolate chips to the batter. Caramel Blondies: add 1/2 cup of chewy caramels to the batter. 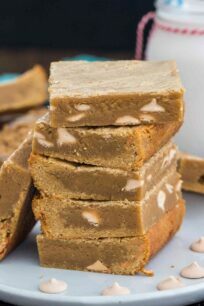 Pecan Blondies: add one cup of chopped pecans to the batter. Walnut Blondies: add one cup of chopped walnuts to the batter. Cranberry Blondies: add one cup of dried cranberries to the batter. What is brown sugar and how can you make it at home? You can usually find light or dark brown sugar in most grocery stores. Brown sugar is soft and moist right out of the packaging, with a deep caramel flavor. Brown sugar is nothing but white sugar combined with black molasses. The darker the brown sugar, the more molasses is in the mixture. How to make light brown sugar: combine 1 cup of white granulated sugar with 1 teaspoon of black molasses and stir until fully combined. Store in an airtight container. How to make dark brown sugar: combine 1 cup of white granulated sugar with 2 teaspoons of black molasses and stir until fully combined. Store in an airtight container. Cool the blondies completely and do not glaze them. Fully wrap the bars in plastic food wrap, tightly. After that wrap in aluminum foil or place in freezer bags. Unwrap blondies from the foil and place them on a plate covered with parchment paper. Let them stand at room temperature for 3-4 hours. If not sliced, cut them now into squares or bars. If needed let them stand an hour or two more, until fully thawed. Transfer to the fridge in an airtight container and store for 3-4 days. 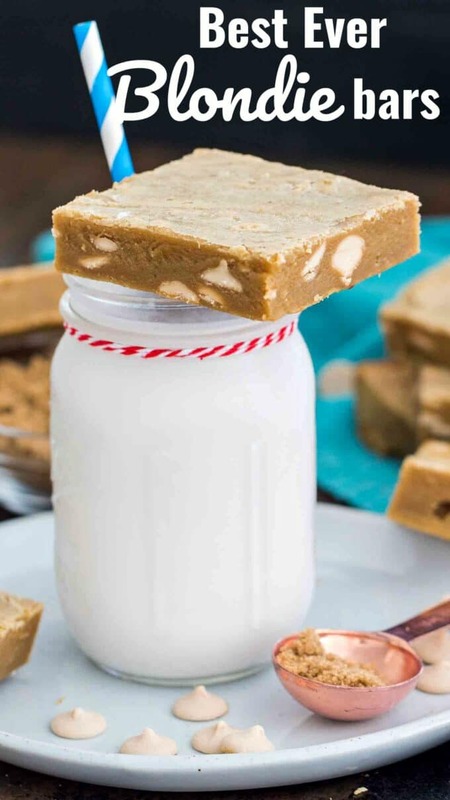 Best Blondie Recipe to make the most ooey gooey and chewy blondies. 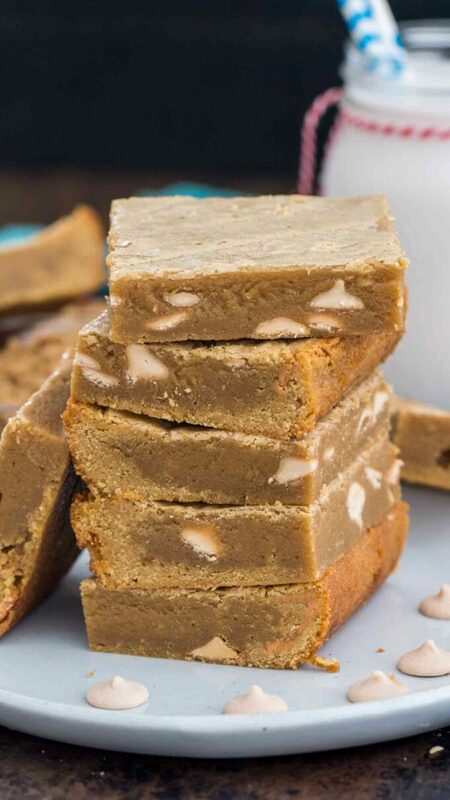 Easy to make in one bowl, these blondies are rich, indulgent and flavorful. Butter and line an 8x8 inch baking pan with parchment paper in a way that it has two handles. Set aside. Add dark brown sugar to a medium bowl. Add melted butter and whisk to combine until the mixture is smooth and shiny. Make sure the mixture is not hot, otherwise it may curd the eggs. Add vanilla extract, eggs and egg yolk. Whisk until fully combined. Add the all purpose flour and salt. Using a spatula, fold it in and stir until combined. Don't over-mix. Fold in the butterscotch chips or other desired mix-ins. Bake for 25-30 minutes, until the top is golden brown and it looks set and not wobbly. The sides of the cake will look done and a golden brown color. Do not over-bake, the cake will continue baking once removed from the oven, due to to the residual heat it packs. Once done, remove pan from the oven and place it on a cooling rack. The blondies are very soft and tender now, let them cool in the pan, don't attempt to lift them right away. Once cooled, but still slightly warm, using the parchment paper handles, lift the blondies from the pan and transfer to a cutting board. Cut the blondies into squares and serve. 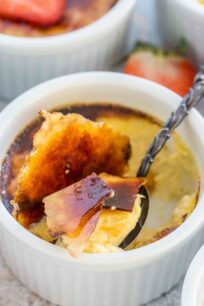 I can always go for this dessert, it will always be my favorite! One of my all time faves! And with all that brown sugar, it HAS to be good! What a great treat! I love it! 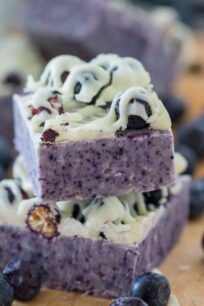 So great for grab and go snacks and desserts! These will be great to have on hand this week! I’ve made these twice. 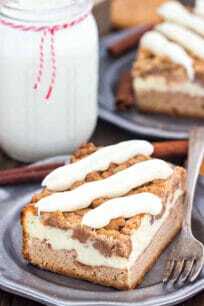 Amazing blondie recipe!! Thank you! !